If you're flying into to Boston and looking for the fastest, easiest, and most convenient way to get Downtown, no need to look farther: just hop on a water taxi from Logan Airport and enjoy the scenic cruise across the Harbor. In just 7-8 minutes, you'll pull up at a wharf on the Downtown waterfront. If you have reservations at one of the top hotels on or near the waterfront, you'll stroll into the lobby within just three or four minutes. Or, if you're heading to another Boston location, just hop on the T at one of the stations near the waterfront such as South or North Station. 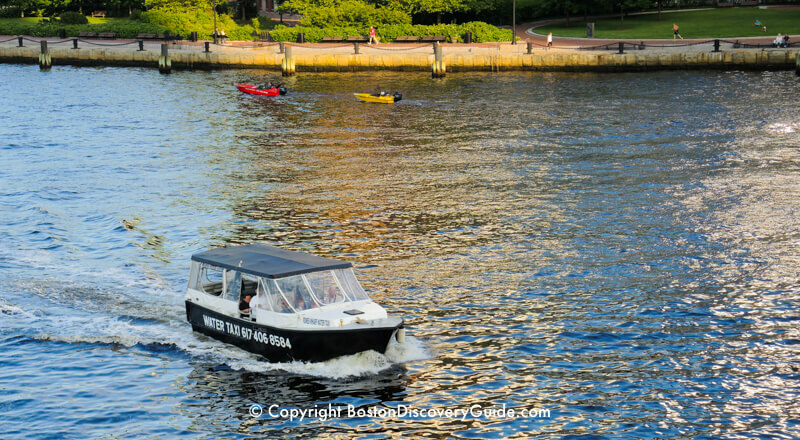 Boston has two excellent local water taxi services - Boston Harbor Cruises Water Taxi and Rowes Wharf Water Transport - and both will pick you up at the Logan Dock. In addition, both water taxi fleets operate year-round and stop at numerous places along the waterfront. Traveling by water taxi to and from the airport could not be easier. But here are 3 tips to make your water taxi trips between Downtown Boston and the airport even easier. Signs directing you to Logan Dock, where you'll board a water taxi, are posted in many places throughout the airport. After you collect your checked bags, go to the Ground Transportation area in your arrival terminal at Logan and get on Massport's complimentary shuttle bus #66. Let the driver know that you're going to the Logan Dock and will need a water taxi. The driver will call ahead to say that a passenger is on the way. Once you arrive at Logan Dock, tell the dispatcher where you want to go on the Boston waterfront. 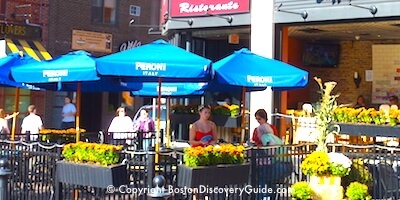 You don't need to know the name of a particular wharf - just the name of your hotel or another destination such as South Station or TD Garden is enough. If you want a particular taxi service, you need to ask for it by name. Alternately, you can call for a water taxi yourself once you're on the #66 shuttle bus. The advantage to doing this is that it may shorten your wait. Water taxis usually take about 5-10 minutes to arrive after being called. You can find their phone numbers here. Water taxis are designed to navigate through wind, snow, and ice. The boats are covered and heated during winter months, keeping the ride warmer and more comfortable than you might expect. 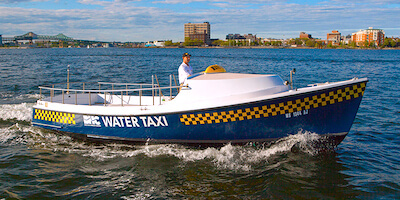 Occasionally, if the Boston weather is very bad (for example, near-hurricane force wind or a blinding snow storm), the water taxi companies suspend service for safety reasons. Of course, those conditions usually ground flights as well so if these extreme conditions occur, you probably will not be landing at Logan until the weather calms down. If you need more information about the #66 shuttle bus service or the Logan Dock, call 800-235-6426 (TTY: 1-800-262-3335). Both water taxi companies offer Boston Logan airport transportation from Logan Dock to Downtown wharfs such as Central Wharf, Long Wharf, and Rowes Wharf, as well as between many other points along Boston's waterfront. Rates differ slightly by company. 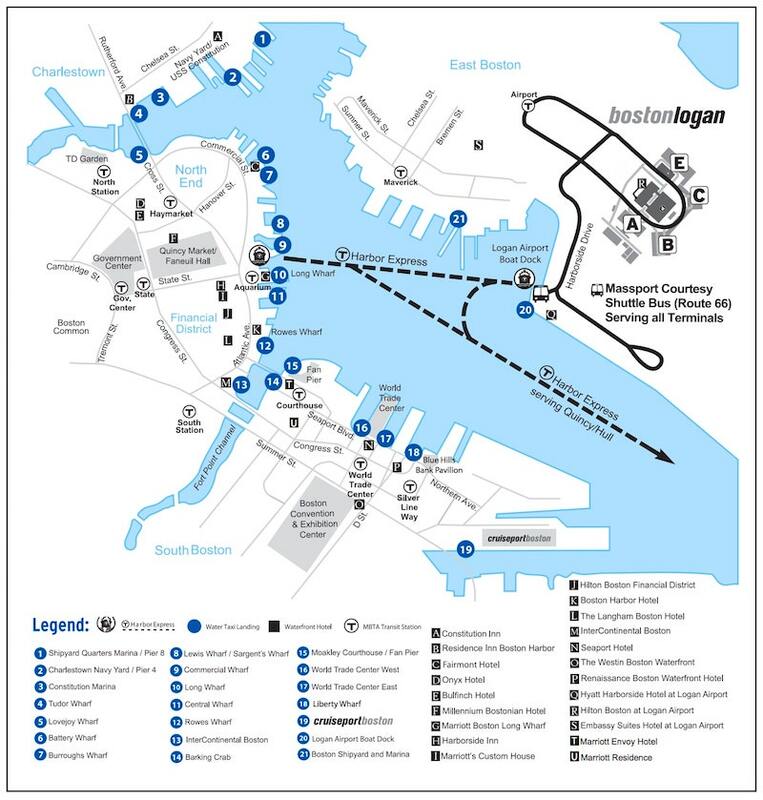 Boston Harbor Cruises charges $12 per person each way for all stops on their map, except for the Black Falcon Pier (where cruise boats dock), which is $20. Children under 12 ride free with a paying adult, and if you have a same-day ticket for another BHC ferry or excursion, you'll get a reduced rate. Rowes Wharf Water Transport also charges $12 per person for the 7-minute trip from Boston Logan Airport to the Downtown wharfs, but offers a round-trip ticket for $20, and special deals for cruise ship passengers arriving at the Black Falcon Terminal. 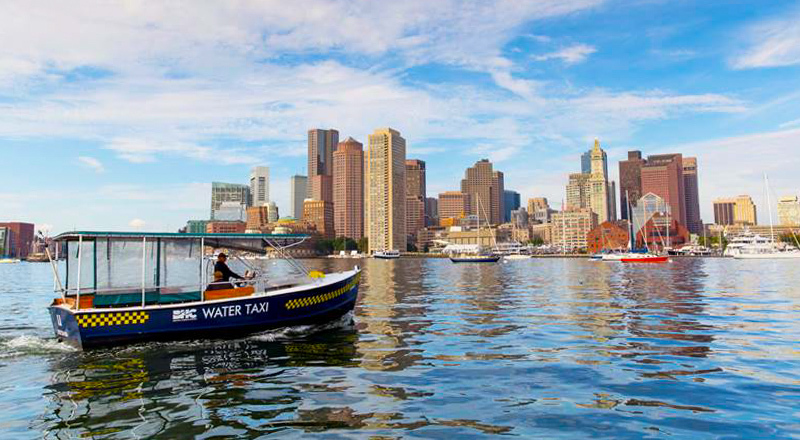 Boston's water taxis can pick up (and drop off) passengers at any point along the waterfront with a dock or wharf where they can pull up. In addition to the popular Logan - Downtown route, the water taxis can be the fastest way to get to a lot of points along the Inner Harbor for a reasonable rate. Depending on where you're going, water taxis can also be cheaper than land taxis. To be fair . . . you can travel back and forth between downtown and Logan Airport for even less money if you take the T (Boston's subway). However, the "catch" is that only the Blue Line goes to the Airport stop, which means that unless the Aquarium stop (next to the New England Aquarium and Long Wharf Marriott Hotel) is where you need to be, the water taxi offers a lot more flexibility and convenience due to all of its arrival/departure locations along the waterfront. Plus, you get to enjoy beautiful views of Boston from the boat! 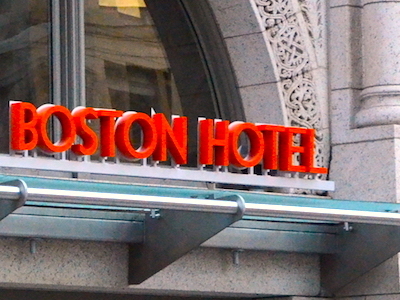 Want to know more about the hotels shown on the Massport water taxi landing map above? Boston Marriott Long Wharf - Waterfront hotel next to the Boston Aquarium and Faneuil Marketplace - huge favorite with families! The Langham Boston - Elegant British-owned hotel in a historic building - don't miss the chocolate bar and afternoon tea! Need to Store Luggage? Find Out Where . . .